To this day, in the nightstand table in my parent’s bedroom, I can still find them. They are in chronological order, held together with a large elastic band ~ every report card of mine from Kindergarten to Grade 13. I’m assuming that my brother’s pile is not as thick as there may be one or two of his secondary school ones missing in action. The joys of snail mail in the 1980’s and the ability for certain documents to get lost in the mail. In looking back through the stack, the format has certainly changed. Years ago my parents were provided with a handwritten tiny booklet with a few grades and one or two sentences. Today we provide parents with neatly typed four pages of grades/marks, expectations, strengths and next steps towards improvement. But regardless of the format one thing has not changed over the years and that is a parent’s pride in reading their child’s report card. All parents are reading report cards for the same thing. They want to know that the teacher cares about their child and that the teacher knows their child as a person and as a learner. 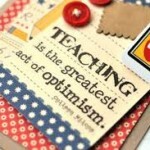 They want to read what their child is capable of doing and how the teacher is prepared to help their child improve. Over the past 10 years, I’ve had the pleasure of reading many well-crafted, meaningful and informative report cards. My feedback to staff has always been the same, “Remember you are writing the report for a child’s parent to read.” These children are the apple of their parent’s eye and the keeper of their hopes and dreams for the future. Parents don’t want to read a grocery list of what their child cannot do. As parents they know their children very well. 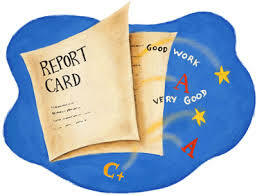 A teacher’s job is to give purposeful, productive feedback that provides parents with hope that the next report card will be even better, as the teacher is going to do all that he/she can to continue their child’s learning journey and accompany them on that journey. Last week I was at the hair salon and my stylist was sharing the news of her daughter’s very first report card. She could quote verbatim what her daughter’s teacher had said about her ability to interact with others, how well she shared materials and how much she seemed to enjoy school. My stylist was not as concerned about what her daughter could or couldn’t do, but she was thrilled that her daughter’s teacher cared and knew her. We always need to remember that during the weekdays teachers get to spend more waking hours with children than their parents do. So, parents need to know that their children are cared about. “Best report card line ever….”…has clearly learned that mistakes support brain growth and she does not appear to be worried to make them”. Well written Ms. Elliott…I may have to steal it! I appreciated this comment because it not only showcased that Ms. Elliott knows her students, but that other educators admire good comments when they read them through the eyes of a parent. Report card writing is demanding, especially when it is done effectively. We never underestimate how challenging it is to capture and document student learning. 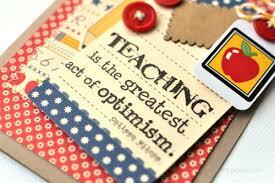 Especially when students are continually on their learning journey. For those educators who know their audience and the power of generating a thoughtful, articulate, inspiring report card, THANK You! One day, your students may stumble upon a well preserved stack of report cards and read them, knowing all too well how much you cared and how much your words inspired them to continue to learn each and every day. 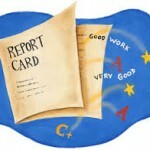 When you reflect on the report cards you received as a student, what do you remember the most?